Happy Thanksgiving to those of you who have recently celebrated (or who are celebrating late). I’m thankful for my health, my friends and family, and for my body and mind that allow me to creatively find work as a self-employed creative person. Since this year’s Thanksgiving would be my first following the auto-immune protocol, it was very important to me to keep it as traditional as possible. I wanted the normalcy of turkey/chicken, stuffing and cranberry sauce. I wanted pie. And I wanted lots of leftovers to enjoy after the fact. In addition to needing to design an AIP Thanksgiving menu, I thought I would need to prepare it all in our RV. But as it turned out, a friend offered us his driveway and the use of his kitchen to prepare my menu and share it with a few friends. This proved to be the best of both worlds. My friend prepared a few dishes. He modified his usual turkey recipe a bit for me – he used olive oil instead of butter and watched the spices. He cooked it on his big green egg charcoal grill and it was probably the best turkey I’ve ever had! He did use a little bit of sugar and a little bit of wine, but since it was such a small amount I knew I would be okay with moderation. He also prepared brussel sprouts in a fun way (with lime juice) and gravy, which I told him he could prepare however he wanted since I don’t like gravy! 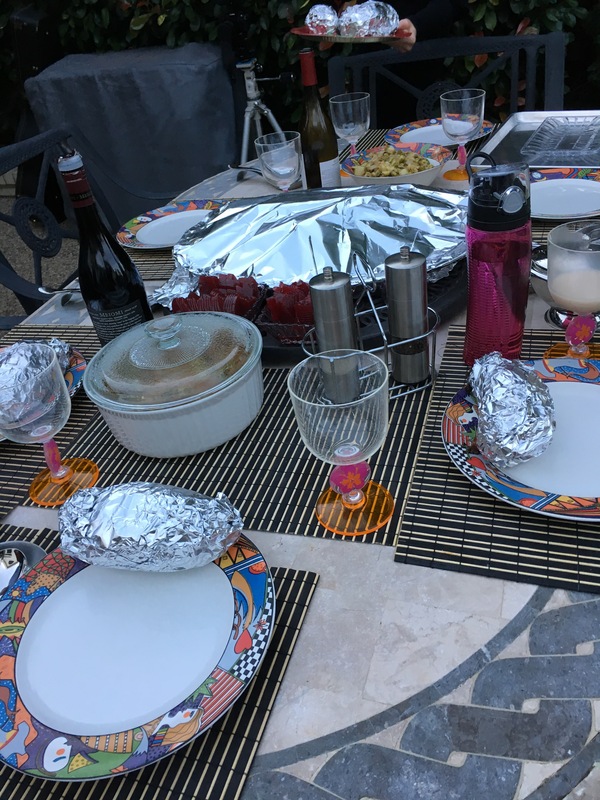 And he put the sweet potatoes I’d washed and put in aluminum foil on the coals after the turkey was ready – they were perfect, caramelizing and delicious, no additions needed. I had bought a couple of cans of organic cranberry sauce. I know I could have made my own, probably without any added sugars that weren’t natural, but since my traditional Thanksgiving always had the stuff from a can, we went with that. And it was awesome of course. (And easy.) Again, moderation is key here with the sugar content. My biggest challenge was executing the stuffing, or dressing as some people call it. 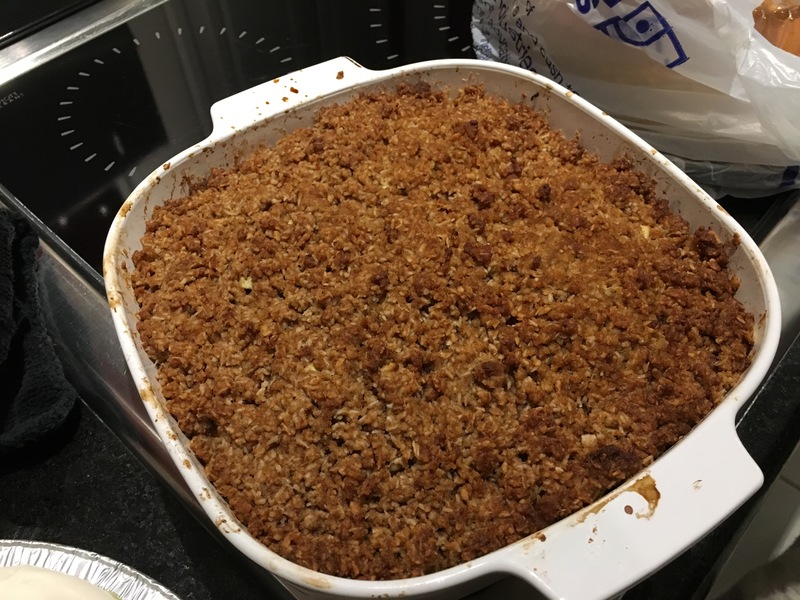 There are a million stuffing recipes out there, but the one I crave is the Stouffer’s bread crumb stuffing right out of the box. Box stuffing is all I have ever had and it’s amazing so that’s basically what I wanted. But “gluten-free” commercial box stuffings have tons of additives and brown rice flour, which I haven’t reintroduced yet. And if I was going to eat this for many days afterward I didn’t want to get sick. So I shopped around for recipes. Most AIP stuffings don’t bother making bread for crumbs. They use a meat or a mushroom base – way easier – or maybe plantains to get something of the right texture. But I wanted my bread. 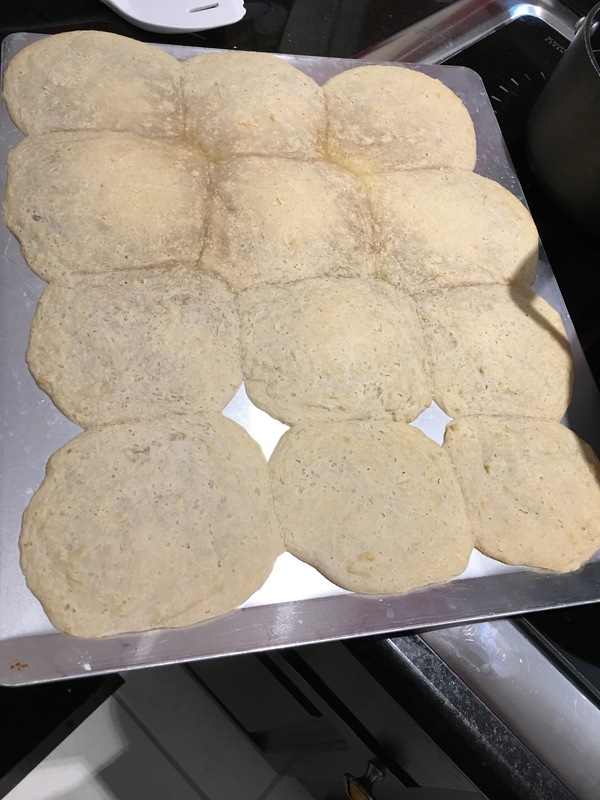 Sadly, my Buttermilk biscuits didn’t rise properly. Maybe they needed more apple cider vinegar? But I crumbled as best I could and hoped for the best. It was chewy rather than crumbly, but it totally did the job and has supplied me with leftovers for days! I used tapioca flour and arrowroot flour. I knew another guest was bringing dessert, so I made only two – apple crisp and key lime pie. But I made an extra key lime for me! Apple crisp is one of the first desserts I ever made from scratch. Because I can’t have oats, the topping is basically a taste of coconut heaven – coconut flakes, coconut oil and coconut butter with coconut sugar where you’d expect brown sugar. I also had to skip the nutmeg. It’s very tasty and not too unhealthy either! My critics said it was very good – they suggested using the coconut whipped topping I made for the pie on this too, and they enjoyed the Granny Smith apples which make sure the recipe has tang rather than too much sweetness. I debated between a few recipes, but eventually I settled on this one from Forest and Fauna. It had three steps. First, you make a crust, using mostly coconut flakes and honey. It’s insanely good even if it’s hard to get it to shape into the perfect crust – no one minded though. Secondly, the filling. It calls for about three avocados per pie. Weird as this may seem, ripe avocado has almost no flavor and a perfect texture to be a vehicle for key lime juice. The filling is perfect, insanely tasty and the perfect consistency after you freeze it. Have I mentioned egg-free, dairy-free, grain-free means almost anyone can eat this deliciousness? I did the final step right before serving dessert. I used a recipe from my new cookbook for the whipped cream since Forest and Fauna’s website wasn’t working right. (The recipes were almost identical.) I went with maple syrup as the sweetener to pair with the cream from coconut milk. My husband got his arm workout in and we were rewarded with delicious whipped cream that the guests raved about. Everyone went nuts about this pie. Even those who don’t normally like key limes and those who weren’t planning to eat dessert. It’s that good. And I managed to fit the second one in my freezer for later! Suffice to say, I’m super-happy with how it turned out. The stuffing was just okay (though with an awesome kick) but if I’m enjoying the leftovers on day 3 I must have done all right! And everything else I’m just thrilled with. ﻿I’m so thankful there are great AIP recipes out there to be found. 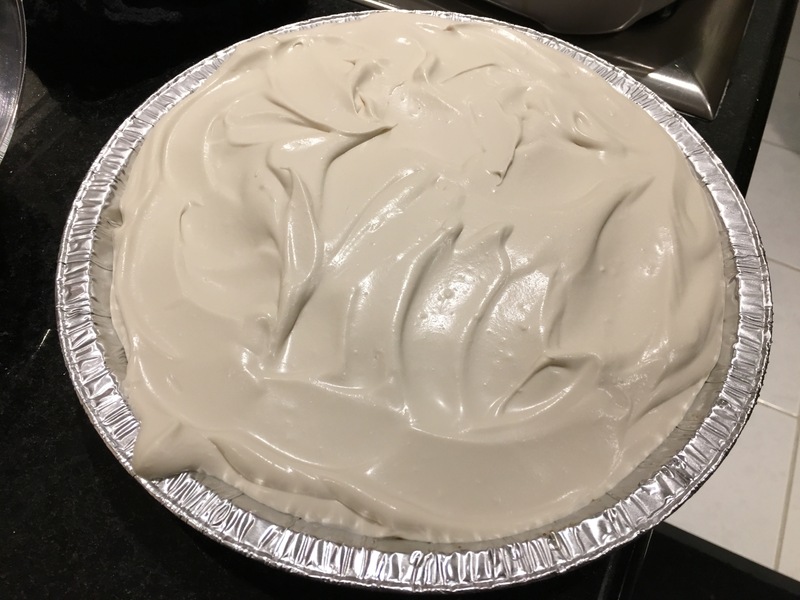 Thanks for reading – and do what my grandmother would and make a key lime pie this Christmas! It’s my favorite.